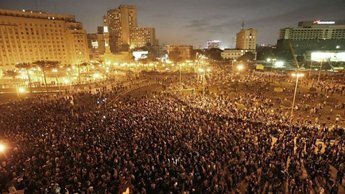 Transcript of an interview with an Egyptian student and activist, describing the strikes and social movements that preceded the present rebellion. A video of the interview can be seen here. University, and is doing his Masters' Degree in History at Georgetown. currently completing his master's degree in history at Georgetown. MOHAMMED EZZELDIN, EGYPTIAN ACTIVIST: Thank you. JAY: So I guess you wish you were there. of Egyptian youth. And now it's--we just--we find the dream coming true. the force of repression so powerful. And there's sort of a facade. surprising. It was--in terms of--. JAY: To hear the words "Mubarak out". JAY: So how did this moment arrive? How did we get here? JAY: Strikes at what kind of places? EZZELDIN: In one place. This city, actually, it include--. JAY: You mean the city--people of the city went on strike. El-Mahalla. So three times they made successful. JAY: And what years were the--? EZZELDIN: 2006, 2007, and April 2008. JAY: And were they met with police repression? which [is] unprecedented in Egyptian history. JAY: This is the last two years now. social media play an important role? made the mission and the task of the Egyptian opposition is really hard. So this is number one. Number two--. interests, Egypt is like the pillar of this US policy for this region. right now it looks very spontaneous. credibility, because people are going and challenging the regime. Islamic extremism. It's being used to stop popular resistance. EZZELDIN: I would say so. For almost 30 years in Egypt it did so. Yeah.